In case you missed it, in the beginning of February an odd news story was floating around the internet and getting airtime in broadcast news. A relic of World War I was found in a shipment of potatoes in Hong Kong. What was the relic? A hand grenade. Believe it or not, this WWI grenade is about the size and shape of chipping potato! The un-detonated WWI hand grenade was found in a shipment of chipping potatoes that was shipped to snack food producer, Calbee, in Hong Kong. Incredibly, the grenade survived almost a century in a field in France, harvested with the potatoes and shipped to Hong Kong, where it was detonated on the factory grounds. While incredible, this story highlights the importance of food safety, something we take seriously in our potato packing shed. We strive to ensure our processing plant is not only efficient and we try to eliminate damage to our potatoes, we also try to ensure our customers receive product that is safe for their factory. We can confidently say we wouldn’t ship chipping potatoes overseas with hand grenades in them. It’s a pretty safe claim since we’re not near any modern war zones, but also because, as you recall, we have a metal detector on our export line. Initially, the Fortress Metal Detector was installed to ensure wire, nails or any other metal items wouldn’t slip past our optical sorter or hand sorting crews and into customer orders. Now, it appears there’s another good purpose. We have invested in a lot of systems in place to make sure our customers receive a product that not only meets their high standards of quality, but is also safe. Though this seems like an odd story to make light of, to us it puts a spotlight on why it’s important to invest in the equipment we have in our potato processing plant. Food safety is something we take seriously at Gold Dust & Walker Farms, and we’ve invested in the equipment to reduce the chances of something our customers don’t want making it out of our shed. Thanks to everyone who could make it our 18th Annual Open House Field Day! Another August was almost over. Grain and hay were being cut, and chipping potatoes were already being dug and shipped. 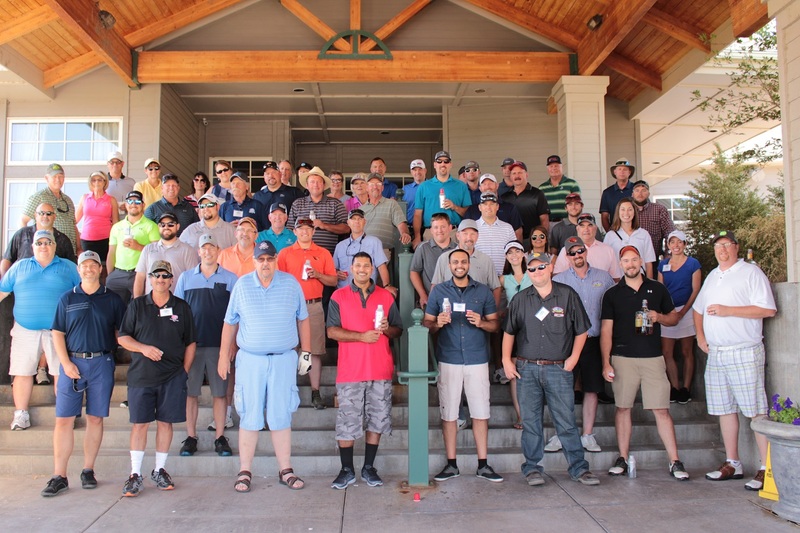 Earlier in the month we had a Leadership Meeting and Employee Appreciation Picnic, making this August a touch busier than normal. And as always this time of year, we opened our doors and headed to the fields for Gold Dust & Walker Farms’ 18th Annual Open House Field Day! This year, the festivities began the night before at Bill and Jan’s house, where Gold Dust and Walker Farms staff mingled with our visitors. Though the past few months in the Klamath Basin were incredibly smokey, the air cleared and everyone was able to enjoy a gorgeous evening outside with cold drinks, great food and good company. A feast of roast, fresh tuna, shrimp and scallops was put together by Jan, Ken Hibbard and Casey Lammers, followed by German chocolate cake and ice cream. Visiting carried on past sunset, and with a touch of smoke still in the air, gave our guests an amazing Klamath Basin sunset. Frankly, we couldn’t have asked for a more beautiful evening. Cheers to our chefs – Jan, Ken and Casey! Bob Gasser is having a pretty serious conversation with Drew Huffman and Kyle Patterson. Weston and Rob Unruh visiting with Jaap Langenberg of Luke’s Organics. Looks like Bill is telling a pretty good story! Sanjay, Gurvinder and Matt enjoying a couple of cold ones. Everyone enjoying the good company and roast beef, tuna and shrimp. The next morning, everyone met at Mike & Wanda’s restaurant in Tulelake. After a welcoming speech from Bill, Lexi introduced Klamath County Museums Manager, Todd Kepple. At our Open House Field Day breakfast, we usually have a speaker, and this year Mr. Kepple put together a presentation about the history of Klamath Basin agriculture. From the Reclamation Project to drawing homesteads from pickle jars to the Bucket Brigade of 2001, Todd’s presentation gave us and our guests incredible insights to how farming and ranching not only changed over the years, but how it changed the Klamath Basin itself. Bill and Lexi warmly welcoming our guests at breakfast. Todd Kepple, Manager of the Klamath County Museum, gave our group a great historical perspective of Klamath Basin ag. Following breakfast, it was time to head to the potato fields! 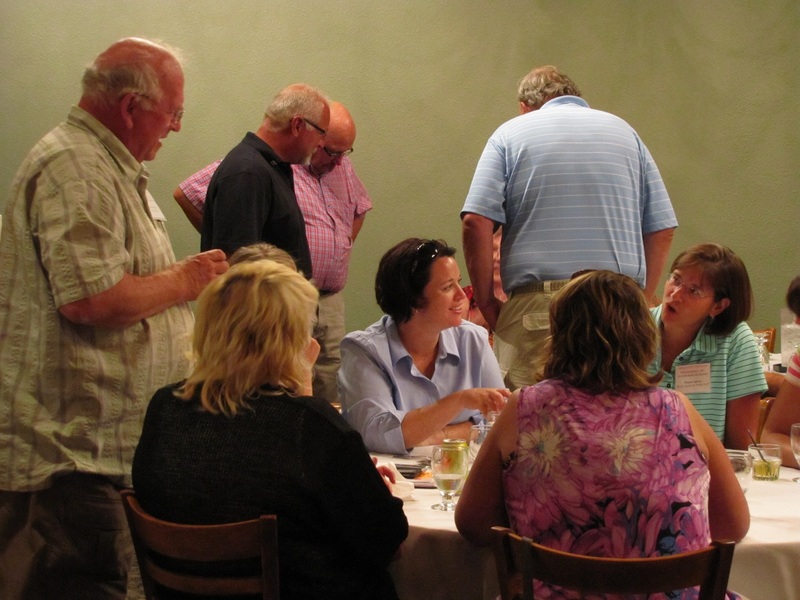 Like last year, our growers showed off their fields and dug up a few spuds to show our group. If you’ve read past posts about our Open House Field Day, you’ve seen pictures of long trains of cars and pickups parked along the fields. This year, we decided it would be more efficient and effective to rent a bus instead of everyone driving to the fields on their own. 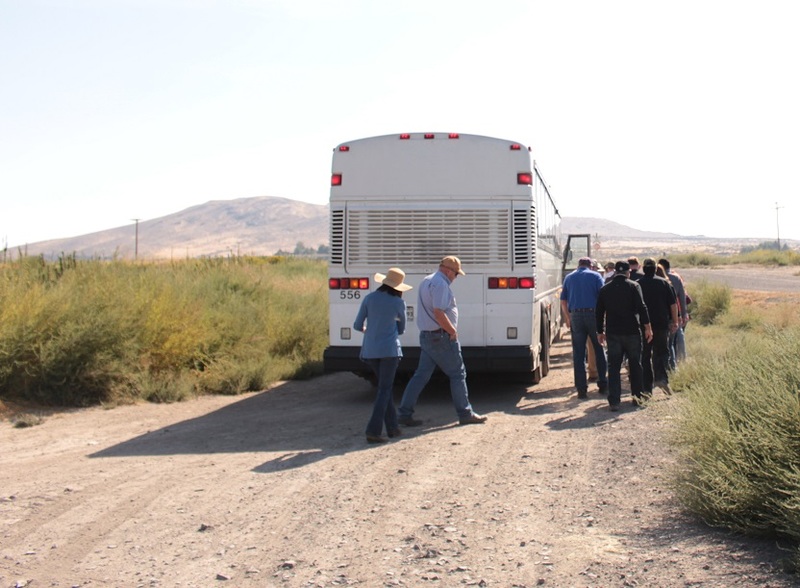 With everyone on the bus, on the way to the fields our growers were able to provide their family’s history of farming in the Klamath Basin as well as answer questions about potato varieties, the ins-and-outs of potato farming and anything else that came to mind. 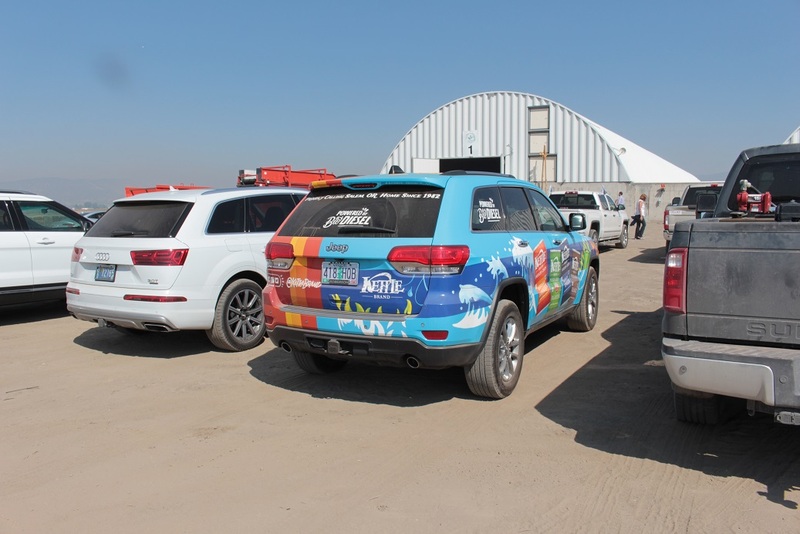 Not only was this a more efficient way for us to get everyone on the field tour, it provided a great way for our guests to chat while learning more about us and our growers. Which growers’ fields did we visit? We started with Luke Robison’s field of 2137 potatoes located just outside of Tulelake. After that, we headed to the leases where Matt Huffman had some 1867 chipping potatoes dug and ready for inspection. Next, we headed back to Tulelake where we visited Sid Staunton’s field of Waneta potatoes. Though we weren’t able to swing by his field located near Lower Klamath Lake, Kyle Patterson shared a bit about his experiences with growing Dakota Pearls, which was fitting because it was on the way to a sandy field of Dakota Pearl chippers grown by Rob Unruh, just a bit north of Gold Dust’s campus. On the way back the shed, Tricia shared a bit about her and Weston’s Basin farming lineage and what brought her back home to farm. Matt Huffman, John and Lays Modesto plant manager Danny Lopez talking quality in Huffman Farms’ field in the Leases. Ed and Sid Staunton shared their grandfather’s desire to make Tulelake look a little more like West Virginia during their field visit. Those are some pretty good looking potatoes, Rob! By the time we made it back to the packing shed, the plant had ended shipping for the day and Matt had samples of the chipping potato varieties Gold Dust and Walker Farms can provide laid out on the production floor. To make this visit even more interesting, Frito Lay reps Sanjay Prasad, Gurvinder Johal and Danny Lopez brought along some fresh potato chips from the Lays plant in Modesto. And yes – these were made with our potatoes we dug this week! 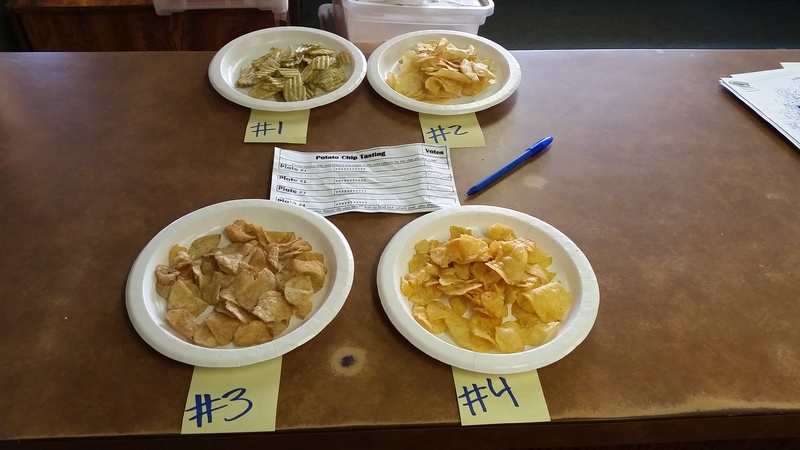 It’s pretty cool to see fresh potato chips next to a sample of chipping potatoes of the same variety. Danny Lopez talking chip quality with Bill and Todd Kepple. 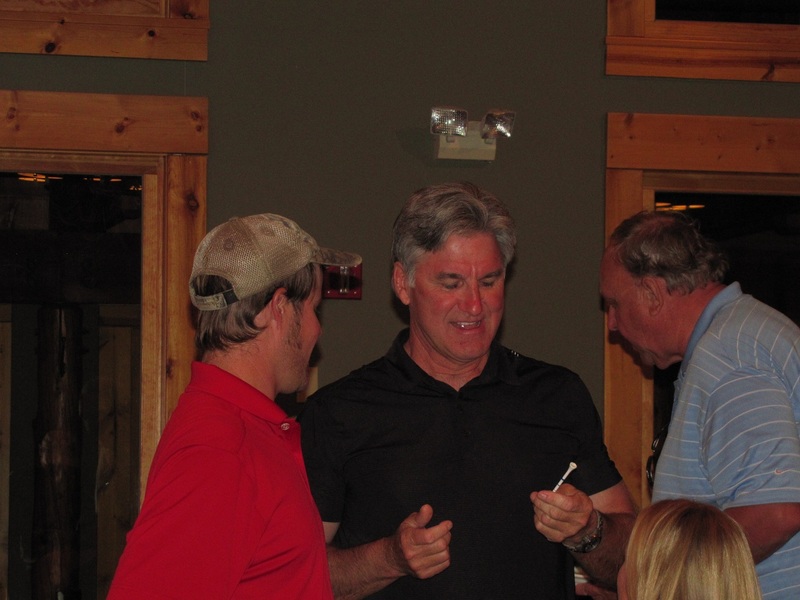 When you get three processing plant guys together, what do you think they’re talking about? Tricia and new grower, Kyle Patterson, checking out the chipping potato samples. 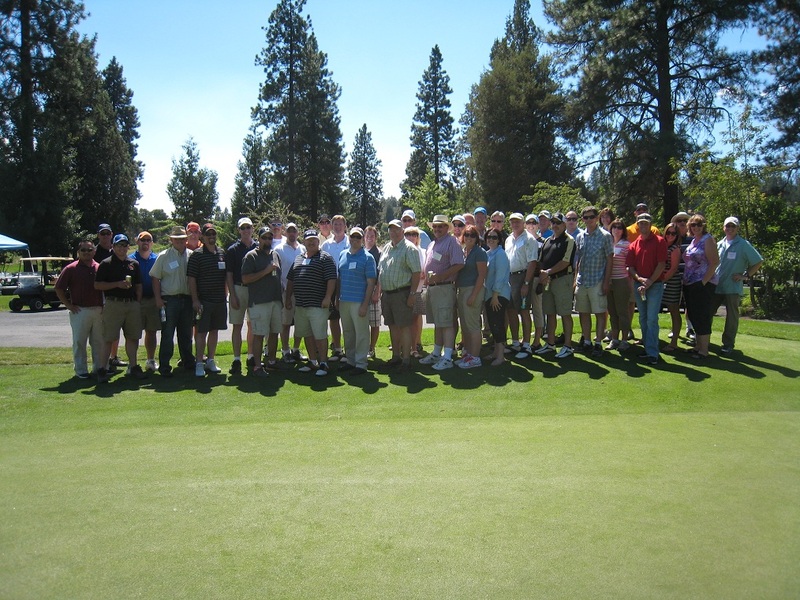 Following the shed tour, our guests made their way to Reames Country Club for a fun golf scramble. 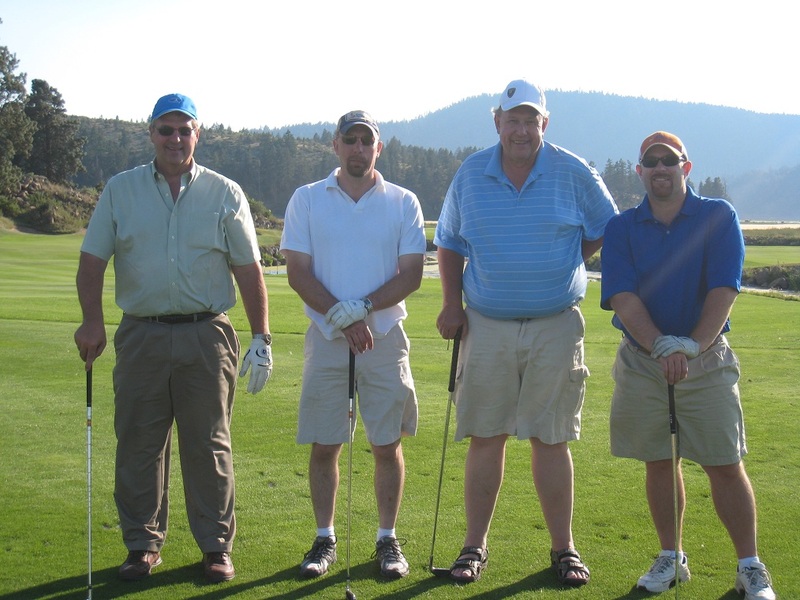 Once the ceremonial shots of Crown had been taken, the teams made their way to the golf course for a shotgun start. 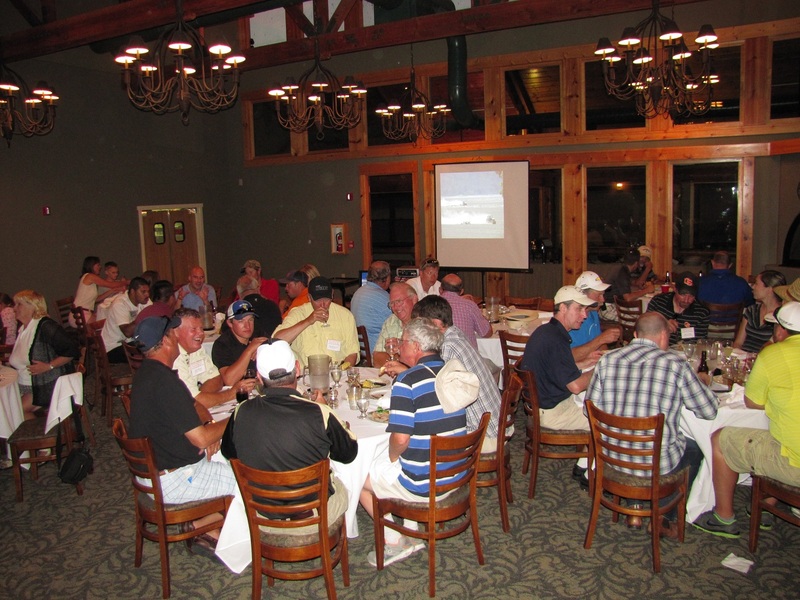 Around 6:30 pm, the teams began to make their way from the golf course to the club house to enjoy cocktails and a dinner put together by the Reames staff. 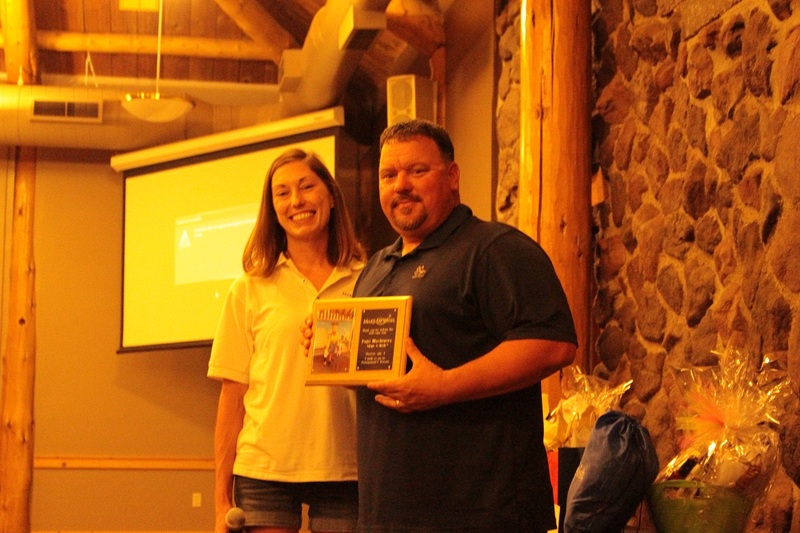 On behalf of Make-A-wish Oregon, Katie gave Billy Conrad of Pape’ Machinery an award for their continued gifting. The Open House Field Day has presented itself as an opportunity to raise money for our local Make-A-Wish chapter, and this year was no different. Katie Walker, Weston’s wife, took this as an opportunity to recognize some of our guests who have given year after year with a plaque to recognize their company’s generosity. After handing out recognition, it was time to start raising pledges. Last year, between the generosity of our guests and Gold Dust and Walker Farms’ matching their pledges, we were able to raise $30,490 along with 135,000 airline miles. This year’s goal was to raise $35,000. After a heartfelt thank you from Make-A-Wish Oregon’s Corporate Alliances Manager, Mallory Tyler, and short video about a Wish recipient, our guests gave generously. When it was all said and done, after Gold Dust matched everyone’s pledges, our crowd raised $45,000 for Make-A-Wish! When we say we work with good people, we don’t just mean they’re good at they do. Their pledges for Make-A-Wish is proof of that. Before our Make-A-Wish fundraiser, there was a short movie about a wish coming true. 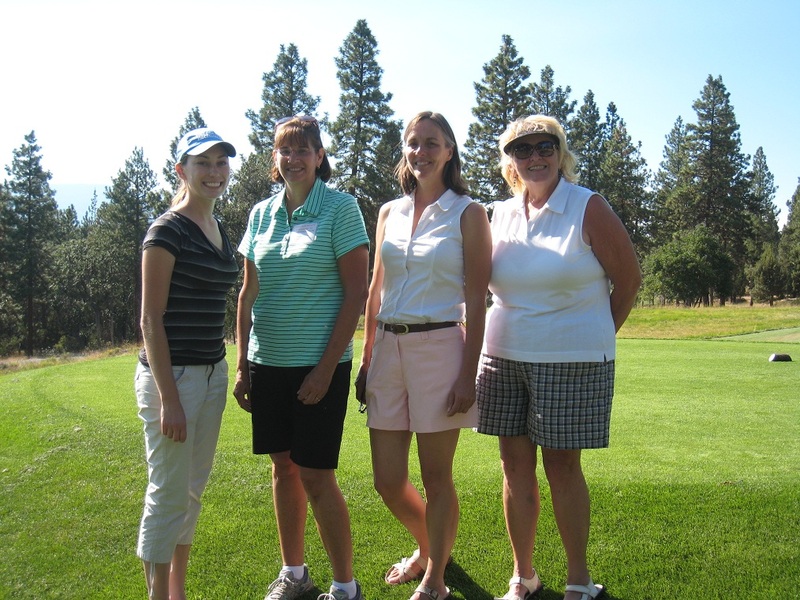 Lexi and Katie led a great round of fundraising for Make-A-Wish Oregon. Well done to our guests! Mallory Tyler, Make-A-Wish Oregon’s Corporate Alliances Manager, thanking our guests for their generosity. 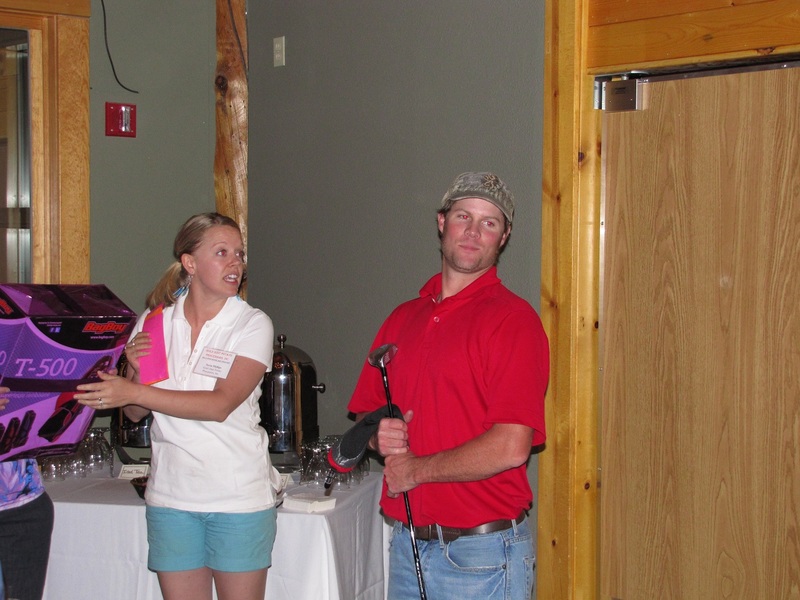 We also went over which teams won the golf scramble and who took home top honors for their skills with the clubs. 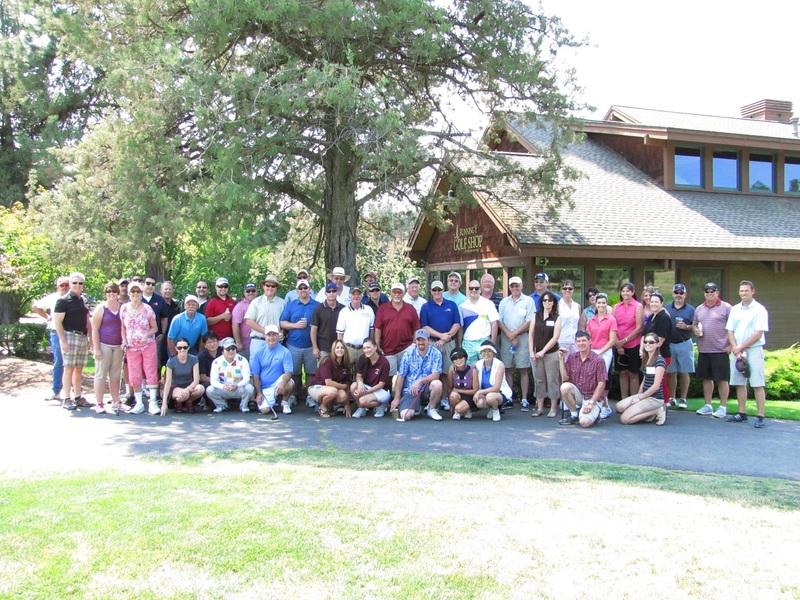 This year, we had a tie for first and second place – both teams shot a 64. After going over the cards and comparing the performance of the front nine, the back nine and doing some other fancy golf math, the team of Matt Thompson, Sanjay Prasad, Erin Plumb and Ty Hulse came out on top, which left second place honors for Rob Unruh, Steve Parkinson and Drew Huffman. Destiny Huffman had an amazing day as she took home not only the Ladies Longest Drive, but also the Closest to the Pin! 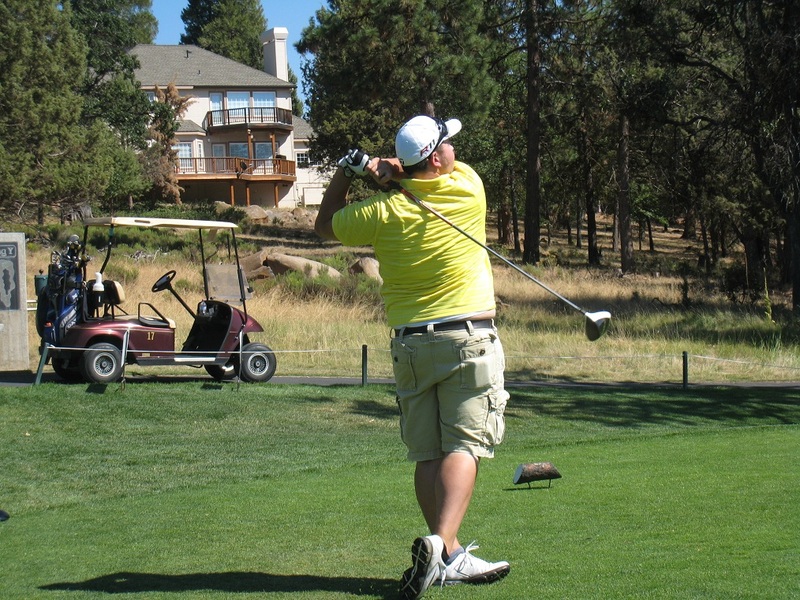 Jared Marshall crushed the ball to take home Men’s Long Drive while Jeff Dahl drove his ball Closest to the Pin to take home the other golf club. Jared Dahl showed all the men what accuracy is about with a KP on his last hole. The gal with all the gifts – Destiney Huffman! Here’s your 1st Place Winners – Erin, Ty, Sanjay and Matt! 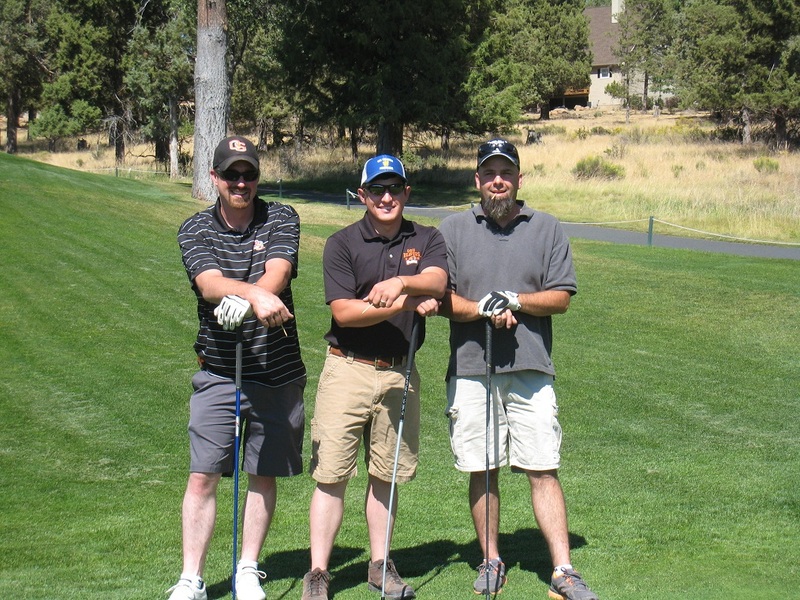 After a heartbreaking first place tie, here’s our second place winners – Drew, Rob and Steve. Before the night was over, the senior partners passed the mic to thank everyone for coming. 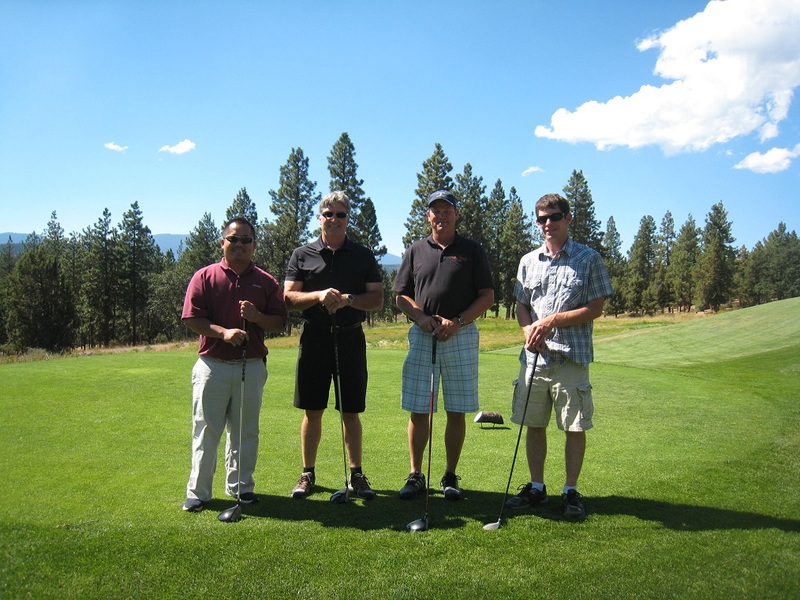 Tricia took this opportunity to highlight five folks who have been attending our Open House Field Day since the beginning – Ron Marshall, Jim Boone, Paul Sproule, and Chris Moudry. Weston thanked the crowd for their generosity and Bill thanked everyone who attended for their continued support and attendance to our Open House Field Day. John wrapped it up with a rousing thank you and pep talk that pointed out that what has made our businesses successful isn’t just us – it was everyone in the audience who got up every morning and did what they do best. His mic drop drew loud applause and was a fitting end to the evening. Bill thanking everyone for making our 18th Annual Open House Field Day another success. Weston thanking our guests for their continued support of Make-A-Wish Oregon. John bringing the house down with a raucous thank you! We always enjoy this opportunity to get together with the growers, suppliers, financiers and customers who have helped us become successful, and this year was no different. Gold Dust and Walker Farms are successful in no small part due to the people we work with. When we say we work with the best – and most giving – we mean it. We hope everyone had a safe trip home and that we’ll see everyone once again next year. Last, but not least – thank you. Thank you for helping us become the amazing businesses we have grown into and thank you for your continued support. Krue Johnston getting ready to leave for his wish – the kid’s riding in style to MFR! 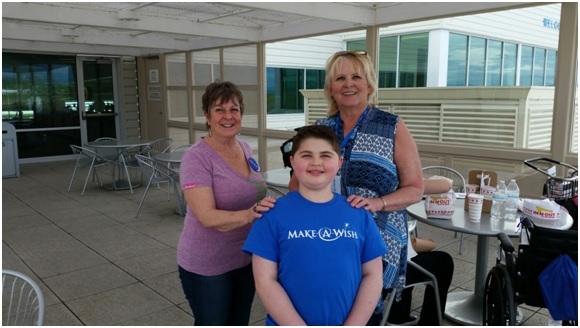 If you’ve followed our blog at all, you’re aware that for the last several years at our Open House Field Day that we have held a fundraiser for our local chapter of Make A Wish. We sincerely appreciate the charity and giving spirit of our guests. However, rarely do they get to see how their generosity impacts any of the children they’re helping. Gold Dust has held Make A Wish fundraisers at our Annual Open House each August. 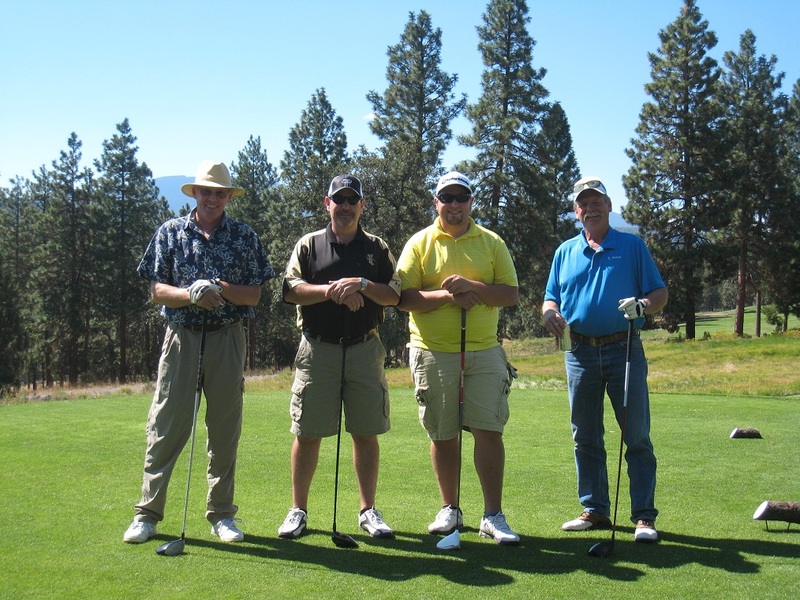 Our participants have helped raise money for the many wishes that the Oregon Make A Wish Organization have provided to children facing life threatening health conditions. 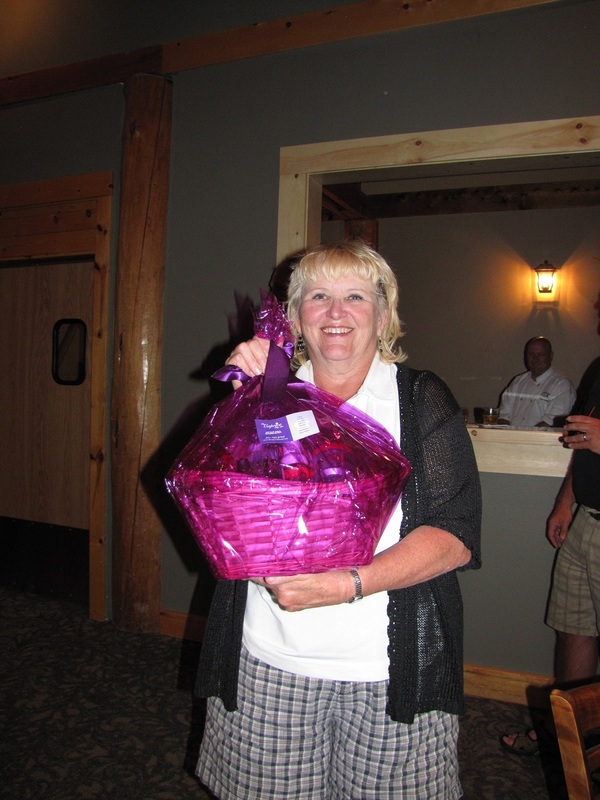 Katie Walker (Weston’s wife) and I have been active wish grantors and are often asked at our annual fundraiser about some of the wishes that the fundraiser has helped. Some of those are local children that are granted wishes. 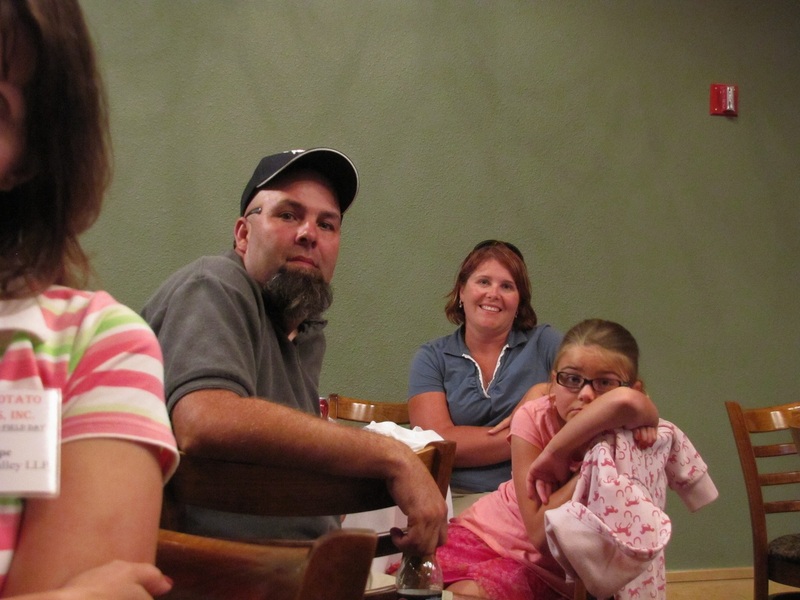 This is a story of one recent wish that was granted to a local boy, Krue Johnston. Krue was diagnosed with Duchene Muscular Dystrophy in 2015. A friend of mine, Kay Ratliff, who is also a wish grantor, and I took on Krue’s wish. After meeting Krue it was discovered his wish was to go to a sandy beach, snorkel, fish and swim with dolphins in the Bahamas. The magic of granting wishes to a wish child becomes real when wish grantors are able to announce to the child that his wish has come true. Krue’s wish to go to the Bahamas happened last May. He and his family flew to Nassau from Medford. One of the duties of wish grantors is to be at the airport to help the family on to their flight and intercept any problems. We were happy to be part of the excitement of beginning Krue’s wish. While waiting for their plane, they planned to eat dinner. Unfortunately the airport restaurant was closed. Krue said he would love to have an In-N-Out Burger and Fries. This is where we come in to grant one more WISH! As you may be aware, we supply In-N-Out with potatoes for their delicious french fries, and luckily for us there was a newly opened In-N-Out store in Medford. I took the families’ orders and drove over to the In-N- Out for their dinner. While there, the wonderful store manager helped prepare Krue’s special wish. She asked what size t-shirt Krue would wear and gave a coveted In-N-Out t-shirt to deliver to Krue. She provided Krue’s meal, an In-N-Out hat, stickers and games. Sadly we did not get the Medford store manager’s name, but we sincerely thank her and In-N-Out for the kindness to Krue. Not saying airport food is bad, but In-N-Out does sound a bit better! Krue, is that a good burger? We would like to take this opportunity to thank all of you who have participated and so generously contributed to our cause for Make A Wish. You have made a dramatic difference is many children’s lives who become Wish children. Krue had a wonderful trip and was able to swim with his dolphins, he got to snorkel and be in the white sand that he was so looking forward to. 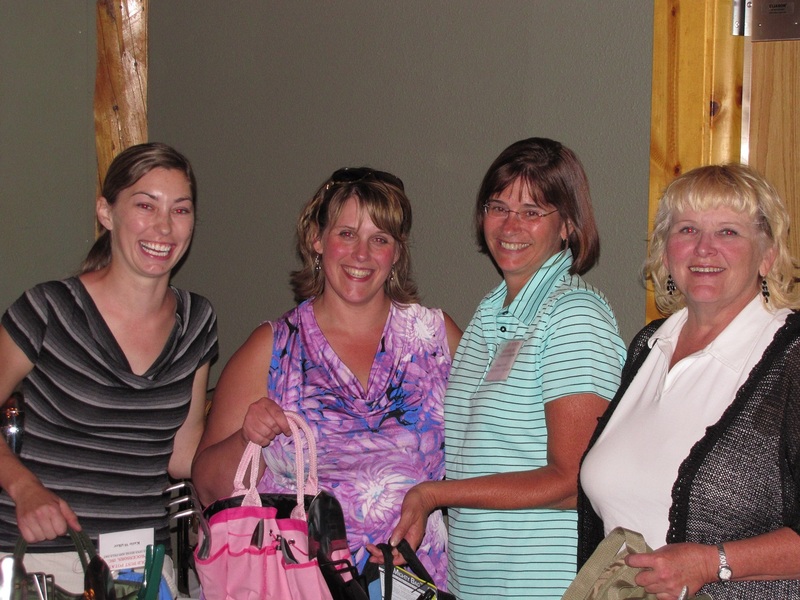 Thank you and hope to see you all again at Gold Dust’s Open House this August. Krue got to swim with dolphins and manta rays as part of his wish! Krue and his mom, Tracy, enjoying floating in the warm, beautiful waters of the Bahamas. As Jan said, we hope to see all our guests at this year’s Open House and Field Day, and thank you to all for supporting Make A Wish. 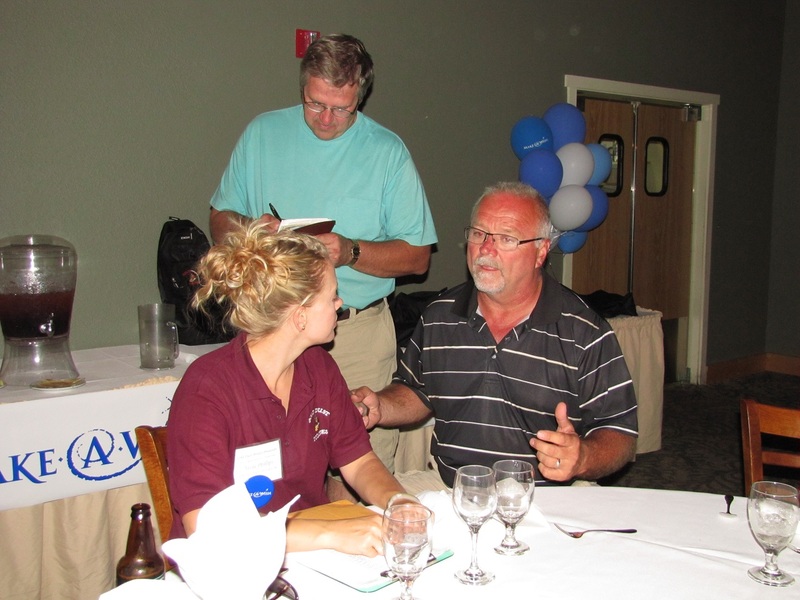 This story shows the caliber of people we do business with and the quality of folks they hire. Thank you again for helping make wishes come true! 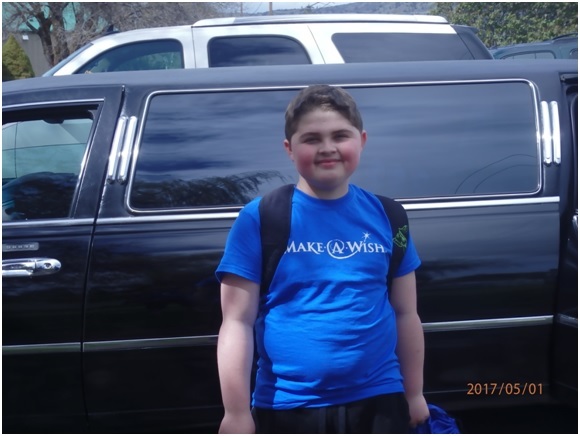 One final thank you before wrapping this up – thank you to Krue’s mom, Tracy, for sharing his story and pictures from his wish. It’s a joy to see what Make-A-Wish is about! It’s “Do Us A Flavor” Time Again! Which would you pick – West Coast Truffle Fries, Southern Biscuits & Gravy, Greektown Gyro or New York Reuben? If you haven’t been to a store, been watching TV or messing around online, then you probably haven’t noticed that Lays’ “Do Us A Flavor” contest is back for 2015. And honestly, we couldn’t be happier! What appears to now be an annual tradition, “Do Us A Flavor” asks people from all over to submit flavors they think would make a tasty tater chip. In years past, we’ve seen Asian influenced flavors such as Sriracha and Wasabi Ginger as well as flavors more familiar to the American palate like Cheesy Garlic Bread and Chicken and Waffles. This year, Lays picked four flavors to battle it out – West Coast Truffle Fries, Greektown Gyro, Southern Biscuits and Gravy, and New York Reuben. Since it’s a contest put on by one of our customers, it only makes sense that we have some of the office staff and people around the shed try them out and decide which was Gold Dust’s favorite flavor. How did the flavors fair? 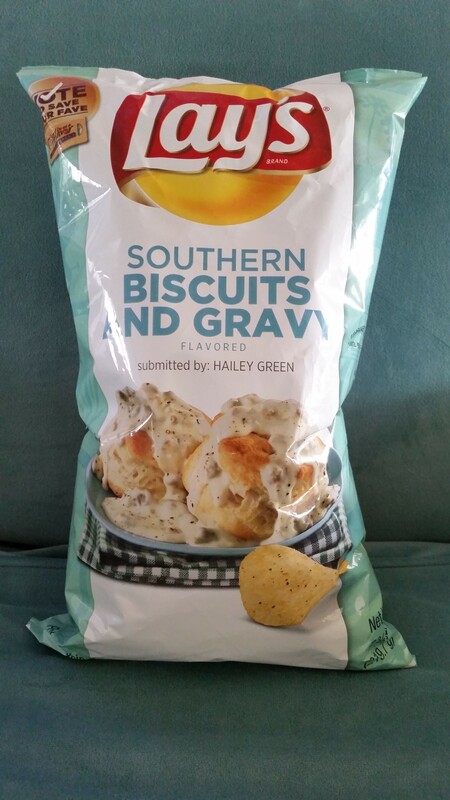 Gold Dust’s Pick – Southern Biscuits & Gravy! In Gold Dust’s voting, Southern Biscuits & Gravy was the winner! Following Southern Biscuits & Gravy was West Coast Truffle Fries, with Greektown Gyro coming in third and New York Reuben coming in fourth. What made Southern Biscuits & Gravy so popular? One comment was they did a great job of catching the essence of sausage gravy with just enough black pepper to make it savory and great for any time of day – from watching an early morning college football game on Saturday morning or wrapping up the evening much later that night after a few beers with friends. West Coast Truffle Fries had a took a thick-cut chip with ridges so it could stand up to a delicious mix of garlic and cheese (some wished the earthy black truffle flavors would have been more forward). As for the Greektown Gyro, Lays managed to somehow coax the flavor of lamb into the kettle-style chips with nice herbal notes standing out from the crowd of flavors. As for the New York Reuben, our tasters could pick up on hints of rye bread and sauerkraut without overpowering the flavor of pastrami they managed to add without actually adding the salty deli meat. All in all, the flavors were all good, and definitely were faithfully and deliciously recreated. If you haven’t tried any of them yet, we suggest you get your best friends and family together and have a tasting party. Surely if they have wine tastings, we can do potato chip tastings, right? Feel free to let us know which flavor was your fave in our comments! Mike Delisle and Joe Dahlen open their check books for Make-A-Wish. Thanks, Mike and Joe! 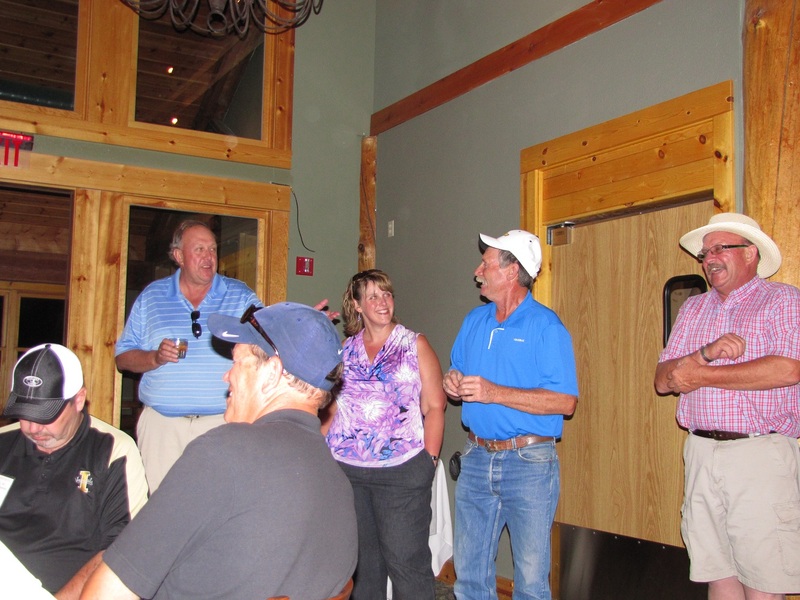 Last month, in the midst of grain and potato harvest, Gold Dust made good on a fundraiser it held during the annual Open House Field Day. 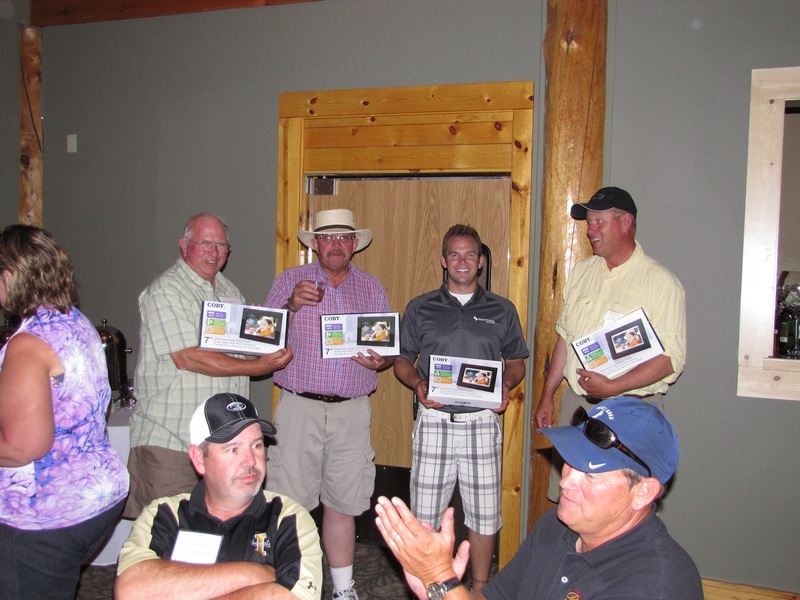 As you may recall, Gold Dust took the opportunity of its annual event to not only focus on their fields and operations, but to also raise money for an organization that’s doing good for the community. With Bill’s wife, Jan, Weston’s wife, Katie, and employee Necia Phillips helping make wishes come true for children with life-threatening illnesses, they chose Make-A-Wish Oregon as the organization they wanted to help. And our guests stepped up and helped. 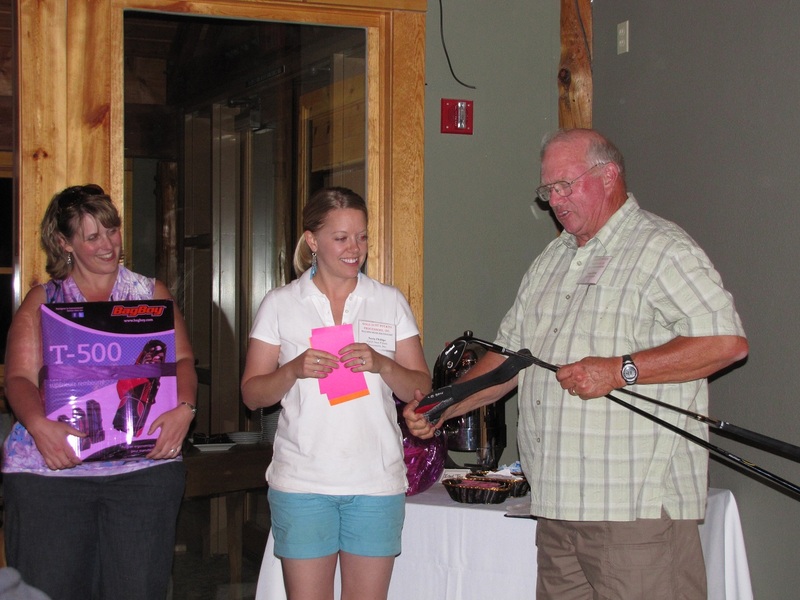 Throughout the Open House Field Day, guests generously pledged and donated a total of $1,900. With all pledges received, Bill, John, Tricia and Weston decided to match what was raised and kicked in another $1,900, bringing the total to $3,800. Considering the average wish costs $7,500 to grant, the generosity of the folks we do business with is going to go a long ways in making a wish come true. 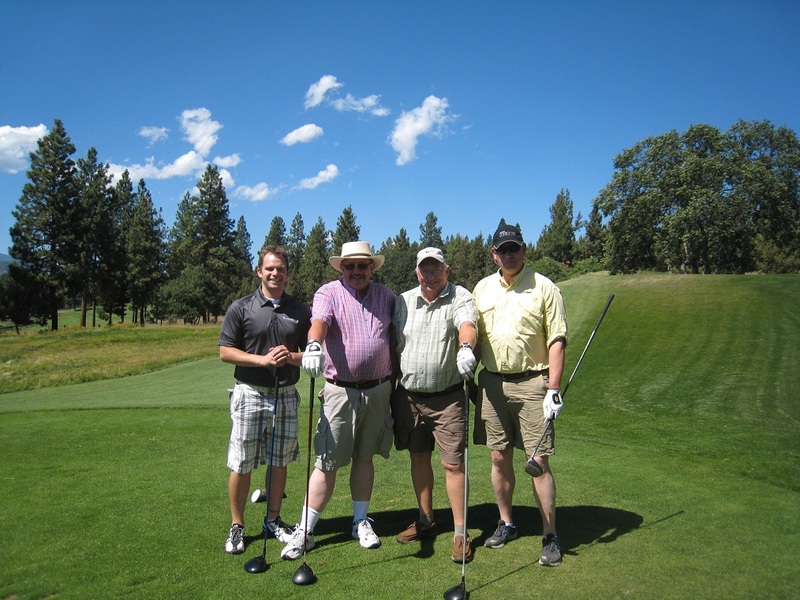 We’re happy that our Open House Field Day was able to help out a worthy cause, and Bill, John, Weston and Tricia would like to thank everyone who came and decided to give. 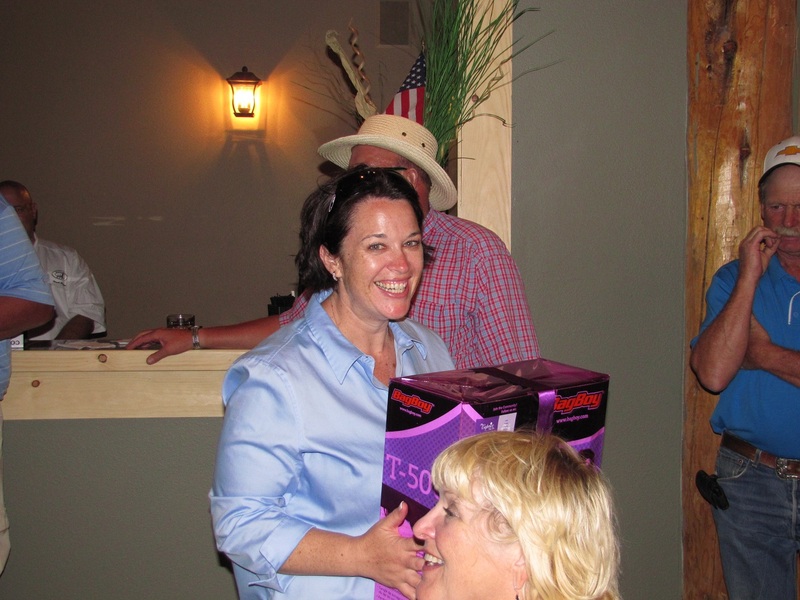 It’s always great to see people travel all the way to the Klamath Basin to see what we do, but it’s even more wonderful to see the level of generosity and kindness of the people who help make our business great. 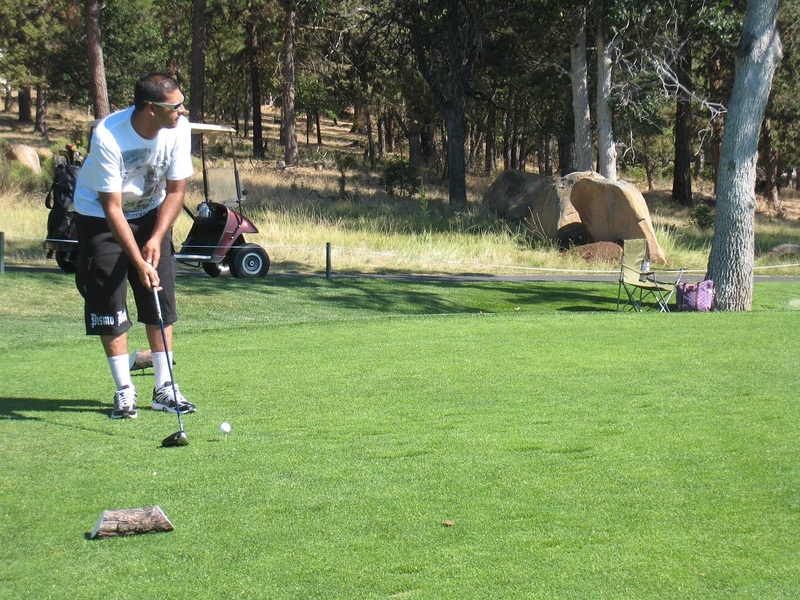 Before we wrap up this post, we’d like to encourage you to visit Make-A-Wish Oregon. There, you can see ways to contribute, whether you decide to open your wallet, volunteer to grant wishes or find other ways to help. And if you want to share out story, be sure to check out our press release. Now THIS is a gathering of smart and good-looking folks! If you haven’t noticed, it’s our busy time of year again. Harvest started in August, and we’re already shipping potatoes. Even with all the action, last month, August 20th to be exact, we took a day to show off our fields and facilities for our 13th Annual Open House Field Day! This year we had another successful Open House Field Day. The day began at Mike and Wanda’s restaurant in Tulelake, CA, with a breakfast meeting. While our guests enjoyed a hearty breakfast, Lexi Crawford gave a presentation about this year’s projects and where we’re headed. After Lexi finished, Greg Addington, chief executive of the Klamath Water Users Association (KWUA), talked to the group about the water situation in the Klamath Basin. We couldn’t call it a field day without actually visiting a field, so we headed out to two fields cared for by two of our growing partners – Huffman Brothers Farm and Staunton Family Farms. Both fields were an excellent representation of the quality chipping potatoes we ship to our customers, and the experience of the Huffman and Staunton families is greatly appreciated by Gold Dust. Once the field tours were finished, the group headed to our Malin processing plant. This year, instead of just talking about potatoes and showing off our packing shed, we had a drone demonstration put on by John Faus and Ben Howard of HoneyComb Corporation, and a talk about protecting potatoes after harvest led by Lucie Grant of Jet Harvest Solutions. We’ve never had presentations from outside companies that we’re working with, making this a first for our Open House Field Day. For the UAV demonstration, the HoneyComb team launched a drone and programmed it fly over the chipping potato field just south of our solar panels. As the UAV flew its flight path, our guests could watch the real-time flight on a large monitor and then check out NDVI photos afterwards. 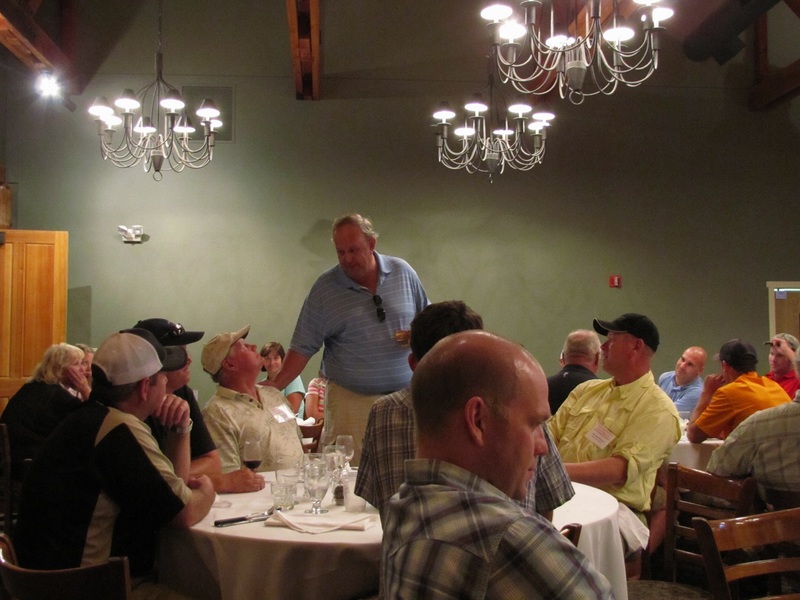 Once the drone had landed and questions had been answered, everyone headed inside to hear how using organic, biological fungicides and pesticides could help potatoes last longer in storage. After Lucie finished, the crowd gathered around the samples collected from the fields and enjoyed Subway sandwiches before heading to the Running Y. Everyone ready for the air show? Looks like Sarge is giving Weston some sage advice! I sure hope the Frito Lays guys are impressed! Why did we head for the Running Y? For the traditional golf scamble of course! 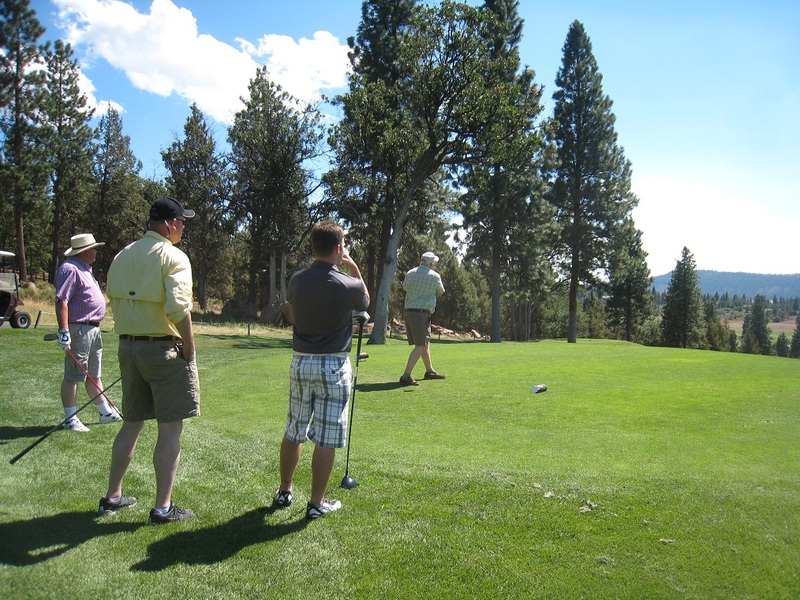 After a group photo and instructions were given, the teams headed to various holes on the course to see which would bring home top (and bottom honors). 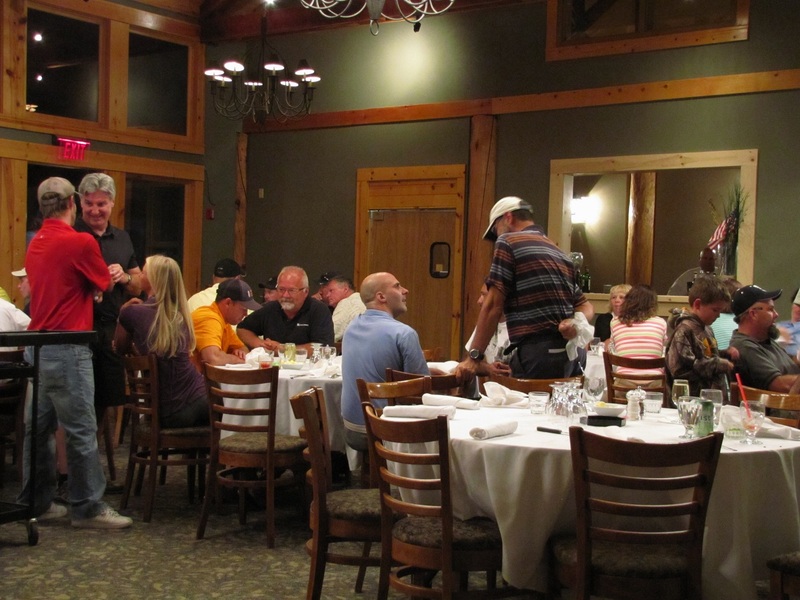 Following the scramble, our guests headed back into the club house for a tri-tip and chicken dinner and to learn which team was top, which team was bottom, and who took home the longest drive and closest to the pin. So who did what? 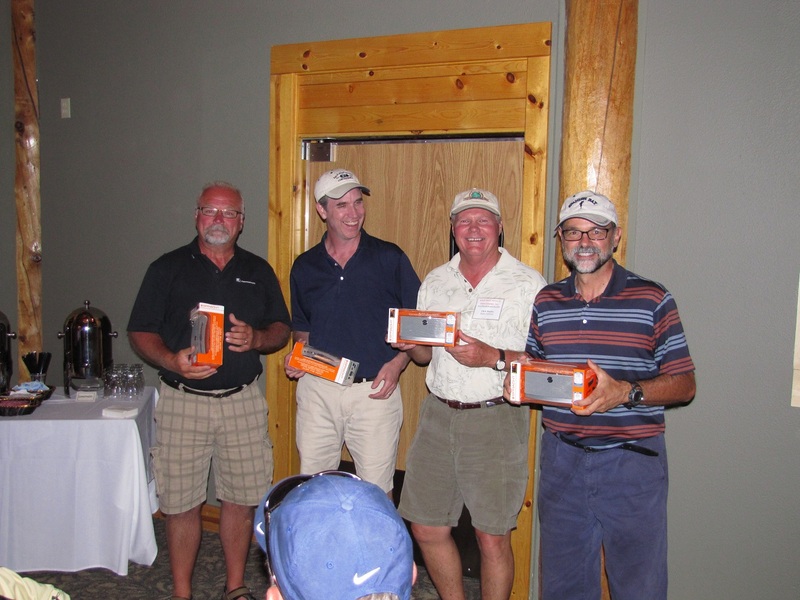 After the scramble awards were given, our partners, Bill, John, Weston and Tricia, thanked everybody for coming and helping our business grow. And with that, they presented long-time advisor and potato expert Duane “Sarge” Preston with a plaque and logo shirt to thank him for all of his years of advice and helping Gold Dust and Walker Brothers grow into the thriving businesses they are today. They also took a moment to thank Lexi, Sarah Mendez and Necia Phillips for their hard work on putting on another terrific Open House Field Day. There’s nothing funny about first place, Greg, Eddie and Paul! 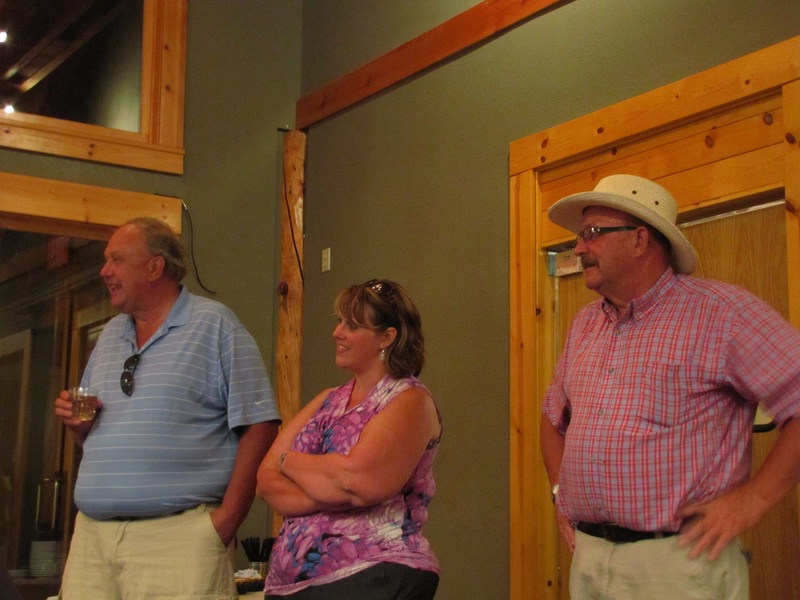 John, Bill, Tricia and Weston thank their guests for their ongoing support. Thank you! John and Bill give Sarge a company shirt. Thanks, Sarge! It’s been a pretty good day, huh Mr. Walker? 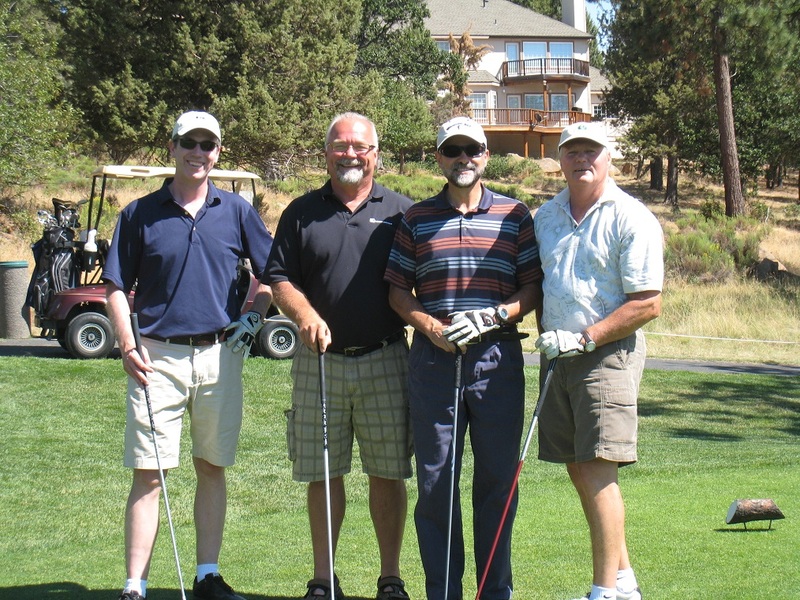 Another of the newest, and perhaps best, additions to the Open House Field Day was fundraising for Make-A-Wish Oregon. As you may have read in a previous post about our sponsorship of Make-A-Wish Oregon, this organization has become dear to the Walker family and Gold Dust employees. As Katie Walker, a Make-A-Wish wish granter, pointed out, the average wish costs $7,000 to grant. Throughout the course of the day, Gold Dust’s guests and employees raised $1,900 for Make-A-Wish, including the $400 cash prize the last place team donated. And more pledges are coming in! Before we wrap up this post, Tricia, Weston, John and Bill would like to thank everybody for taking time from their busy schedules and joining us for our Open House Field Day. They hope everyone had a good time and we’ll see everyone again next year. And they’d be remiss if they didn’t give Lexi, Necia, Sarah, and Trish a big thanks for all of the help putting this event together and on the day itself. Thank you, ladies! 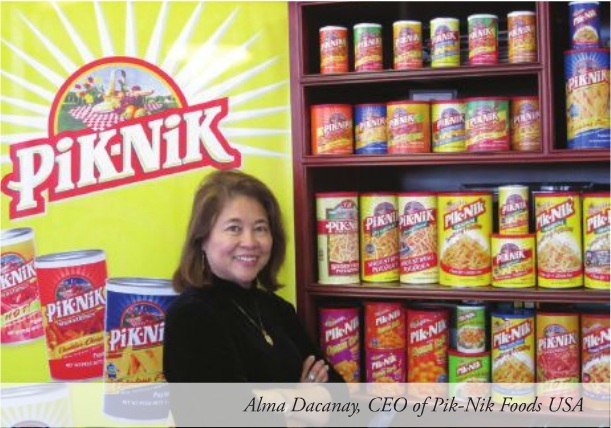 You may recall in a past blog post about Pik Nik’s CEO Alma Dacanay visiting Gold Dust HQ , we mentioned that she and Pik Nik were going to be profiled in an upcoming edition of US Business Executive. Well, we’re happy and very proud to announce that the time has finally come! At the end of last month, we received an email saying the article about Alma and Pik Nik’s global reach was finally in print. After a little waiting, we’ve finally found an online version of the story that’s available to subscribers and non-subscribers alike. 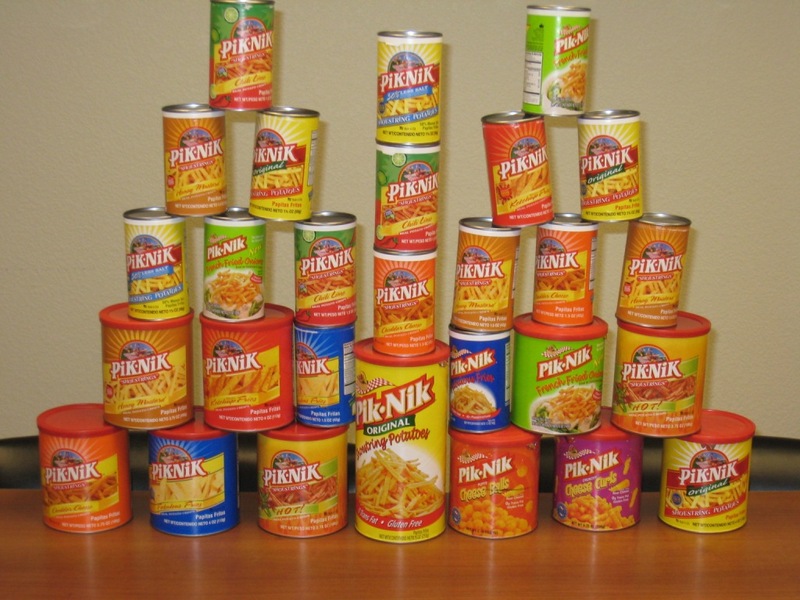 If you have a few minutes to check it out, it’s an interesting read and Alma gives a few insights to Pik Nik’s success, such as why they use the cans they use and flavors they’ve developed. Before we wrap this up, all of us at Gold Dust and Walker Brothers would like to say congratulations to Alma and we can’t wait to see what the future brings for her and Pik Nik’s ongoing success! If you’re a subscriber, you can read it here. If not, you can read it here! Tricia and the Gold Dust crew would like to thank Alma Dacanay of Pik-Nik for visiting and all the snacks! Every once in a while, one of our customers will make the long drive (or even longer flight) from their home to our fields and facilities. We love to show our guests our fields (when they’re full of chipping potatoes, of course!) as well as our world class processing plant when it’s running at full speed. 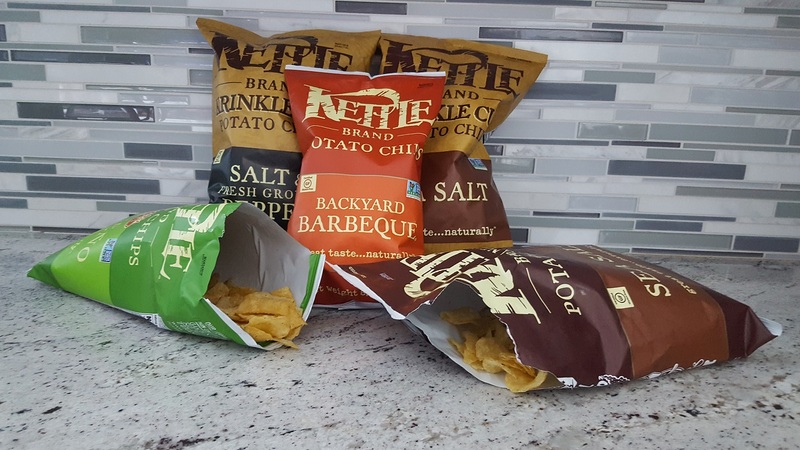 Our customers help us grow and innovate, which in turn allows us to provide a better potato so they can provide a better snack to their customers. Last month, Alma Dacanay and her son, Carlo, paid a visit to our Malin packing shed. 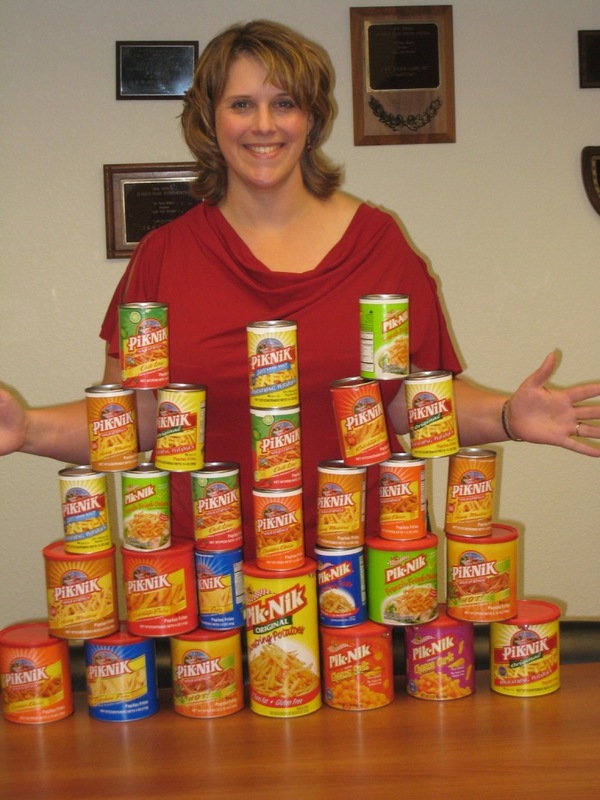 Ms. Dacanay is the CEO of Pik-Nik Foods down in Burlingame, California. While here, we were able to show her the quality of our potatoes as well as what we’re doing to ensure the quality of them from harvest to storage and through the processing plant. If you’re not familiar with Pik-Nik (how could you not be? ), they’ve been frying up American favorites such favorites as French Fried Onions, Cheese Balls and Curls, and, our favorite, Shoestring Potatoes, for over 75 years. Since Pik-Nik only sources fresh potatoes from Oregon and California, their Shoestring Potatoes are absolutely delicious. Think perhaps we’re a little biased since they’re our customer? Then you really need to grab a can of them and try them for yourself! They’re fun to eat and Pik-Nik has a wide range of flavors, including 50% Less Salt, Ketchup, Lime and Chili, and Honey Mustard. There’s a flavor for everyone and we’re sure you’ll find your favorite. And then you still have Cheese Curls and Balls and French Fried Onions to choose from too! Mmmm, Shoestring Potatoes, French Fried Onions and Cheese Balls and Curls. Is it snack time yet? We’d like to thank Ms. Dacanay and Carlisle for visiting us and we hope their visit was as enjoyable for them as it was for us. And thank you very much for the cans of Shoestring Potatoes you left for us to snack on! We enjoyed them very much. 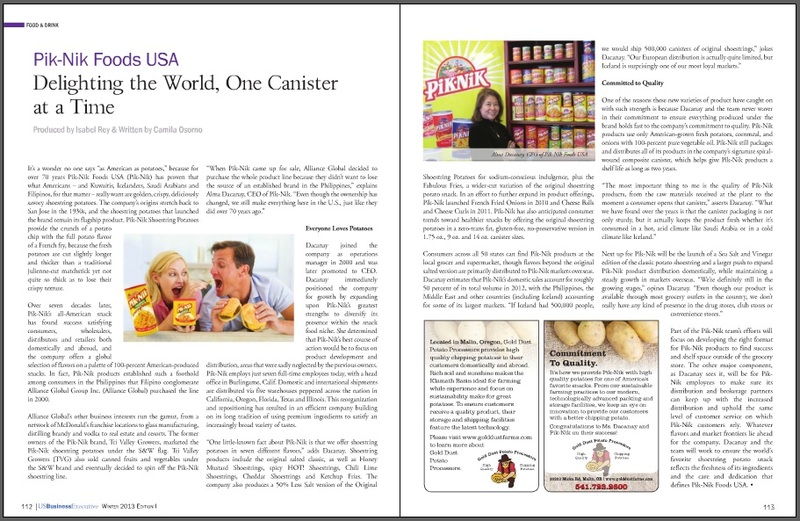 And if you want to learn more about Ms. Dacanay and the work she’s been doing with Pik-Nik, be sure to keep an eye open for a case study about her and Pik-Nik in an upcoming issue of the Food and Drink segment of the quarterly magazine US Business Executive. Just as promised, the second part of our 12th Annual Open House Field Day coverage! After a quick sack lunch of sandwiches, apples, a cookie and potato chips (of course! 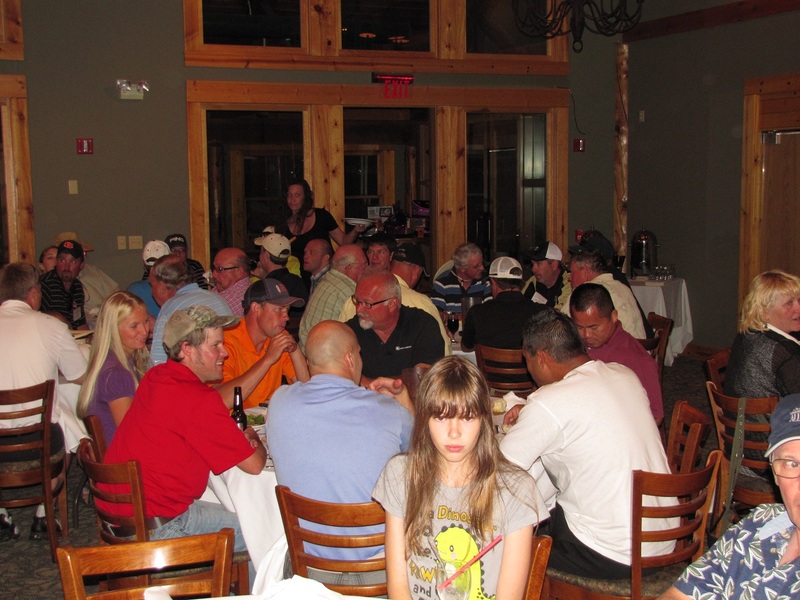 ), the Gold Dust crew and our guests headed back to the Running Y for a round of golf and nice a dinner at the club house. 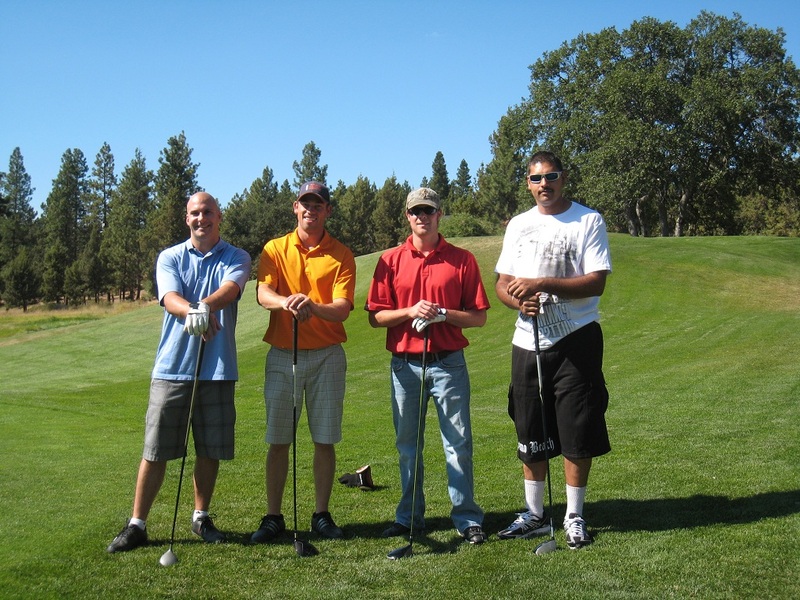 As we do every year, the golf teams competed in a scramble, playing the best ball at every hole. And every year, the competition is pretty fierce. So who took home top (and bottom!) honors? 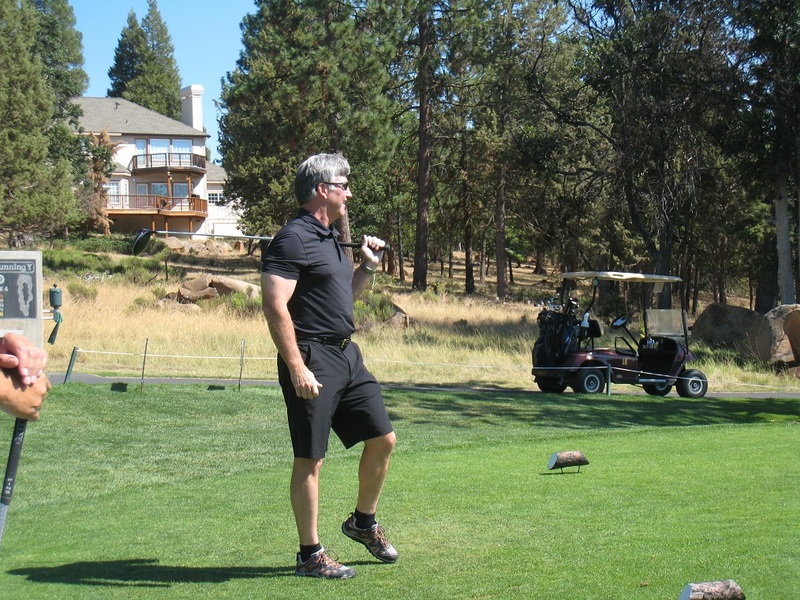 And let it be known, John had the best time out of everyone and hit a whopping 183 yard drive! 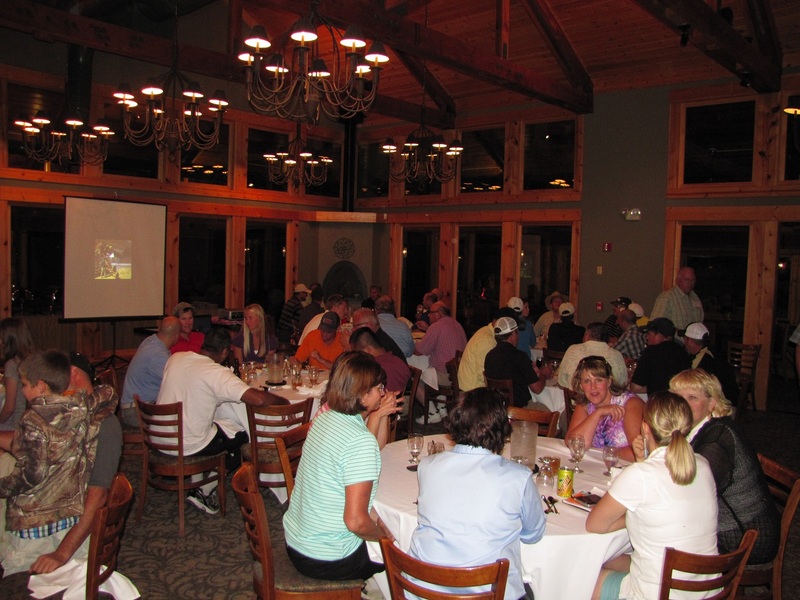 Everyone had a wonderful time on the course and enjoyed a delicious dinner put together by the Running Y catering staff afterwards. 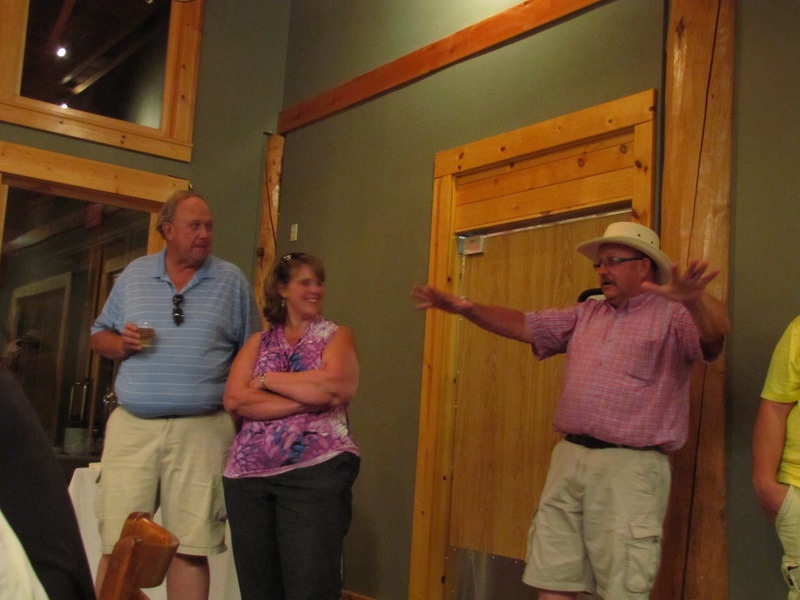 Before the night ended, Bill, John and Tricia thanked our growers and vendors for working with us, our customers for helping us grow and their continued support, and they thanked Necia, Sarah and Tifanie for their help. Without our suppliers, vendors, growers and customers, Gold Dust and Walker Brothers wouldn’t be able to take on challenges like farming the Running Y Ranch, and the support we get from everyone is very much appreciated. And of course, without the hard work of our staff, we wouldn’t be able to put on a successful Open House Field Day! So, Necia, Tifanie and Sarah, thank you for your hard work on making a wonderful day for our guests. We hope everyone who attended had a fun day and made it home safely. Thank you to everyone who attended and your continued support of our business. We look forward to seeing everyone next year! And now – more pictures! Woweee, Sarge! Anybody watching that one? That thing they’re keeping their eyes on? It’s the prize. 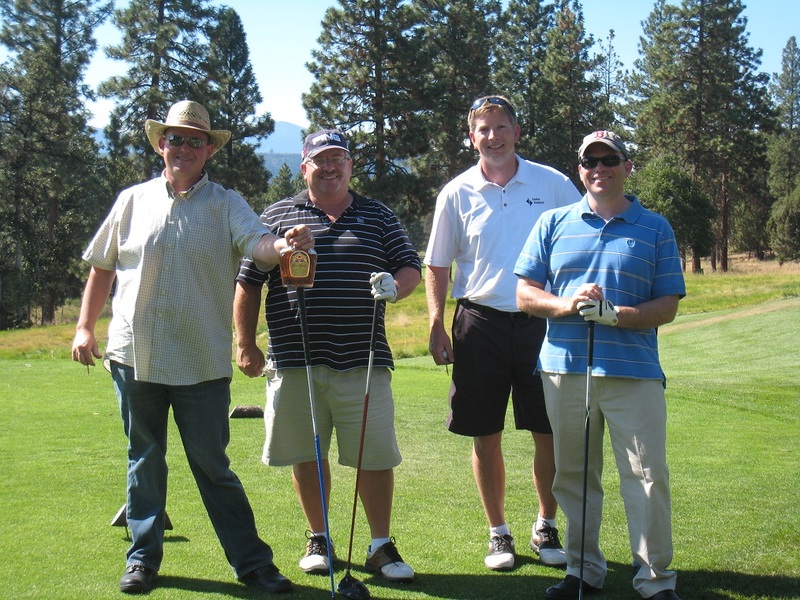 These guys look happy to be on the course! It was that good of a stroke, eh Paul? I smell a ringer . . . . There he is! Ringer! Ringer! Go back on tour! 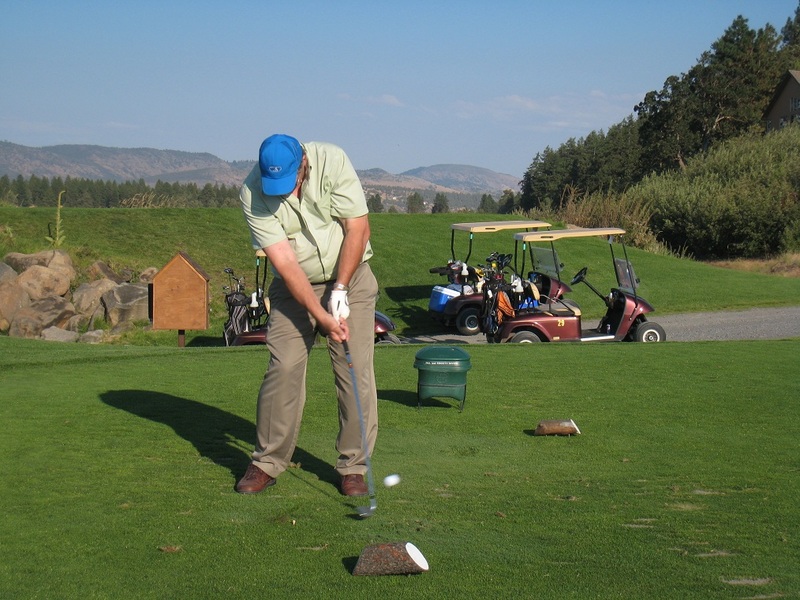 Most people take a practice swing. Jeff, on the other hand, not so much. So, which one of you guys is gonna’ get the longest drive today? C’mon, Sanjay! 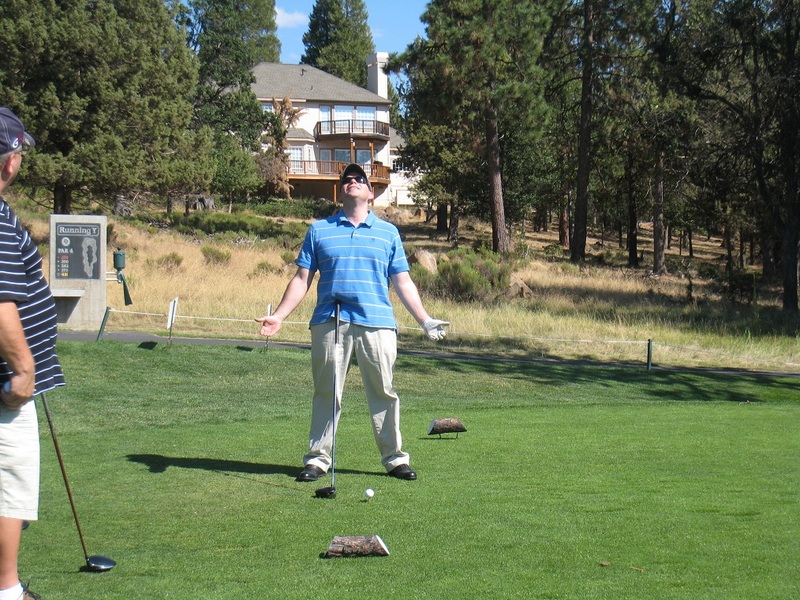 “Happy Gilmore” it! 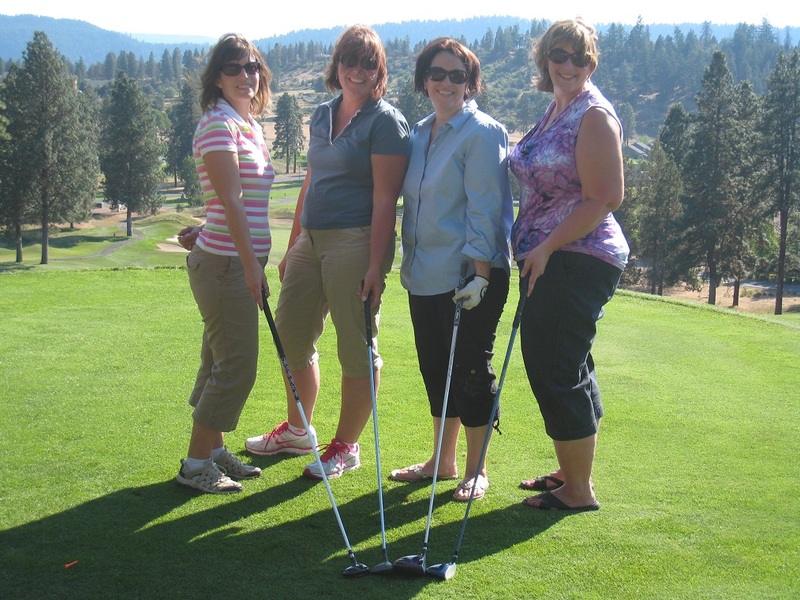 Okay, you ladies are having to much fun. 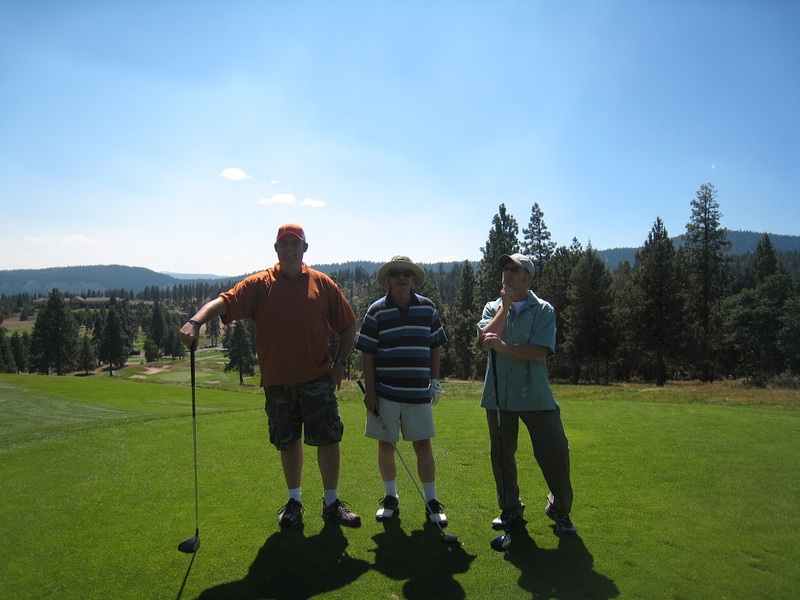 Less smiling, more golfing! The average height of this team? 6’2″. Seriously. 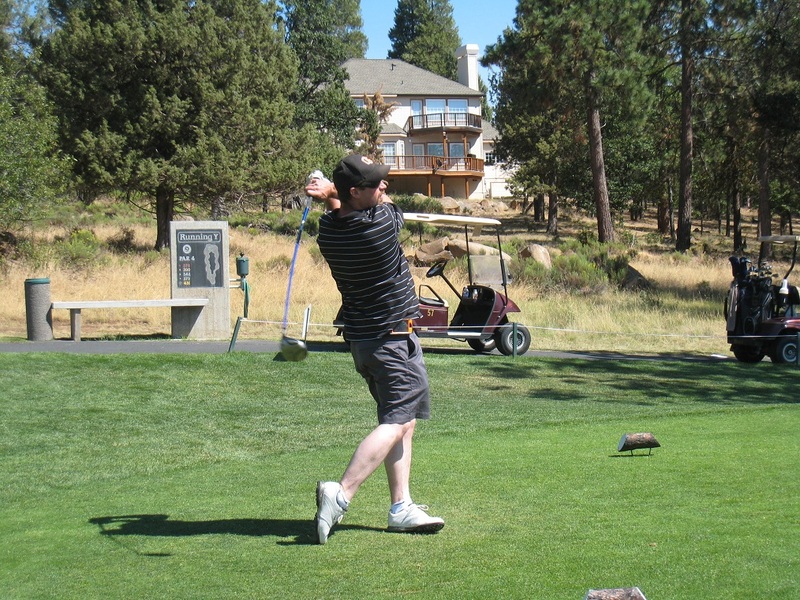 Nice swing, Mike! Nice shot, Sarah! Matt and Paul trading notes on . . . golf tees? And here’s 1st place! Eyes on the prize the whole time. Even being last paid off! If you doubt John had the most fun, then you haven’t seen this photo! Thanks for your help, Tif! That must be a pretty good story!